Oliver Mtukudzi, a long standing regular on South Africa & Zimbabwe airwaves, is one of the most globally recognised cultural icons from our continent since beginning his musical career back in the late 1970’s. With 67 albums under his belt, Oliver also has a doctorate from two universities and is a recipient of some of the most prestigious human rights awards, including The International Council for African Womanism Award (ICAW), recognising his role in the upliftment of African women through his artistic work. Oliver is also the head and owner of an arts Academy called Pakare Paye Arts Centre that offers music and a diversity of art forms, platforming and building talent. Accompanying him on stage on the 15th will be musicians from the academy, including Samantha Mtukudzi, Fiona Gwena on Vocals and Hosho, Keith Musena on drums, Charles Njekesa on bass and vocals, Prosper Mashipe on Keyboard and Rodney Roda on guitar and vocals. With his signature husky voice, he has earned a devoted following across Africa and beyond, and his performances in the South African territory are a rare and special treat for his fans. Having toured around the world several times, Oliver is no stranger to delivering top notch performances and this show promises to bring us his distinctive Tuku Music style up close and personal with artists he has groomed and personally hand-picked for the show. Make sure you catch this iconic figure live in concert. Good Venue, Good Vibes, Good Music! Tickets: R250 at Computicket On Sale NOW! 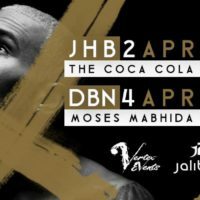 Durban Bags Another International Act! 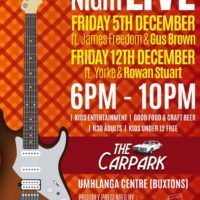 Upmarket – Friday Night Live!